Kaeser’s TK-TM series Modular High Capacity Refrigerated Dryers provide effective energy savings and are the perfect solution for large compressed air systems. These water-cooled dryers remove moisture, oil, and contaminants to consistently deliver clean, dry air. The TK-TM series flow capacities can vary from 1250 scfm to 12,500 scfm, based on combinations of 2500 and 1250 scfm modules. The modular design provides redundancy for critical applications which ensures uninterrupted air supply when a module is removed from operation. Additional modules can easily be added to the system as compressed air demand grows. The modular design also eliminates longer piping runs between dryer units and prevents unnecessary pressure drop. In a typical manufacturing facility, up to 30% of the electricity consumed is for generating compressed air, but compressed air load profiles in most manufacturing facilities fluctuate. 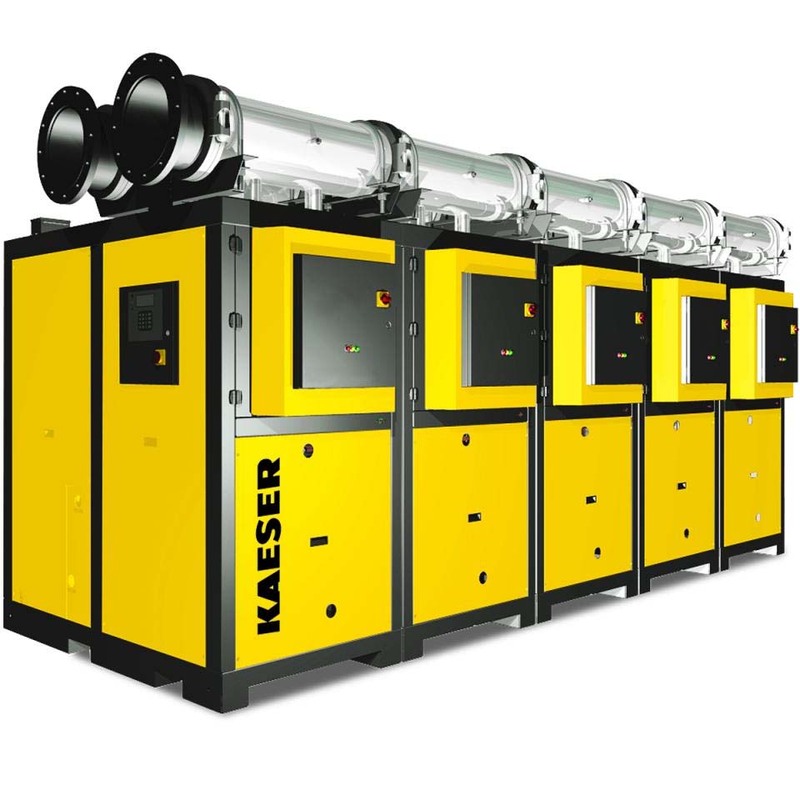 Kaeser’s Modular High Capacity Refrigerated Dryers provide cost-effective energy savings by matching electrical power consumption in direct proportion to air demand. Digital scroll compressors fully maximize energy savings potential. These compressors load and unload based on real-time demand. Since significantly less energy is consumed while unloading, it is possible to deliver proportional energy savings. Unlike non-cycling dryers, linear load matching is achieved from 0 to 100%.